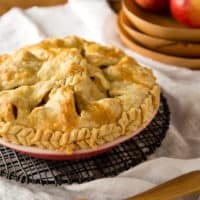 How to Make Pie Crust: Recipe and Tutorial | Good. Food. Stories. No fear here. Really. There’s not much in the world of recipes that makes me nervous or that I don’t think I can handle. 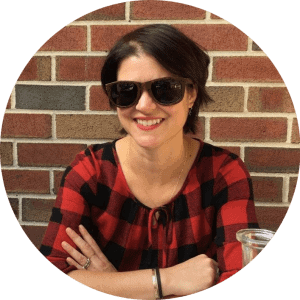 Even before I decided to jump into the world of professional food writing and recipe developing as a full-time job, I never worried about whether or not a dish I was preparing would fail spectacularly; I always attributed my inner confidence and intuition in the kitchen to the scary decision to do this freelance thing and make it work. Or maybe it was the fact that I could always make an excellent pie crust. Judging from the way that so many cooks and bakers, from hobbyists to fellow pros, talk about homemade pie dough, you’d think it was more finicky to make than homemade croissants. More temperamental than Justin Bieber. More dread-inducing than Justin Bieber, come to think of it. 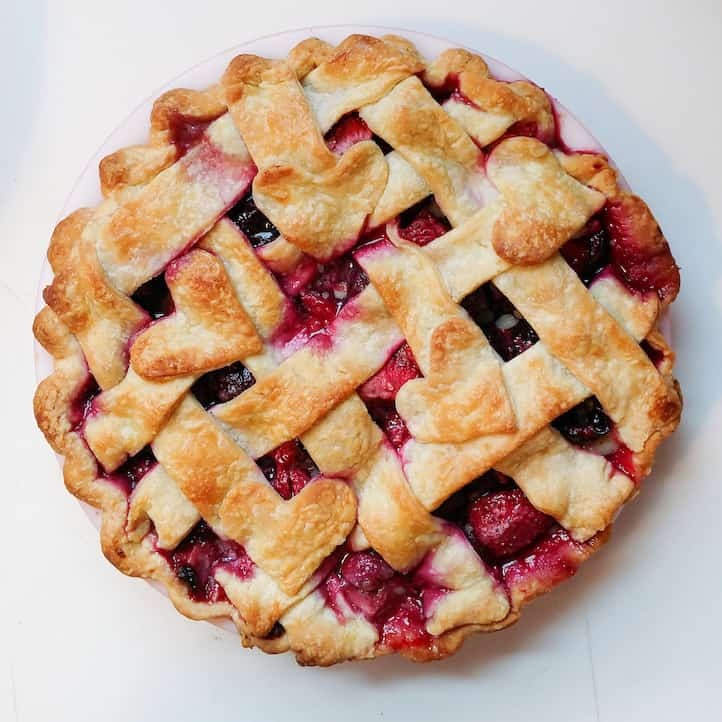 This irrational fear of pie dough needs to stop right now. Like everything else in the kitchen, you have everything to gain through repetition, and there’s no better time to start practicing than in holiday pie season. The weather’s cooler so your butter stays colder and you can turn on your oven without roasting to death yourself, not to mention that there’s a parade of events for you to pawn off your pies (not that they don’t make excellent leftover breakfast food, but you know). 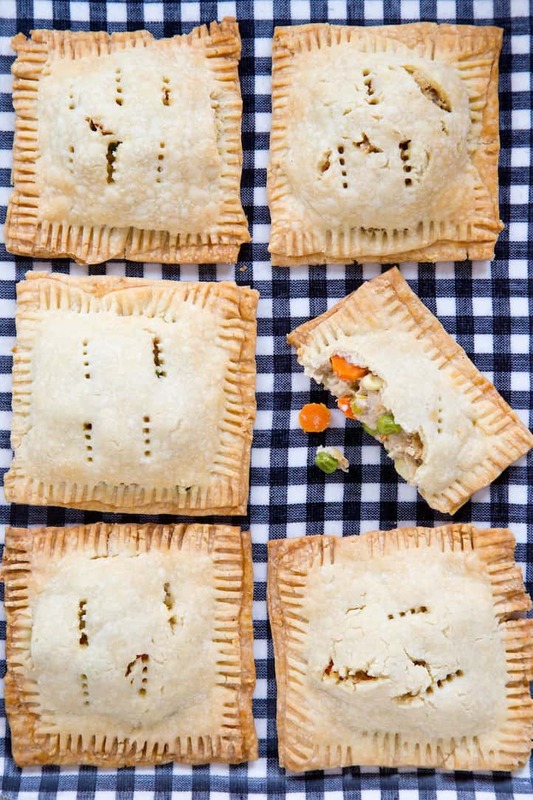 I used to be an all-butter crust gal, but as I tested recipes for my first cookbook, Classic Snacks Made from Scratch: 70 Homemade Versions of Your Favorite Brand-Name Treats, I begrudgingly let shortening into my pie life. The variation in texture between the two fats seems to make the dough simultaneously more structurally sound and easier to manipulate with no loss of flavor. Along the way in my pie journey, I also picked up a few tips and tricks from the baking whisperers at the King Arthur Flour Baking Education Center, like adding the fat to your flour in stages, proving that when it comes to cooking, you never really do stop learning. Use the step-by-step tutorial below to make your own foolproof pie crust. And don’t forget that measuring your ingredients by weight is another way to ensure success by giving you the most accurate ingredient amounts, especially with flour. Now go off and impress all your loved ones with your newfound skills—and don’t let me catch you skulking around the Pillsbury pie crust aisle ever again. 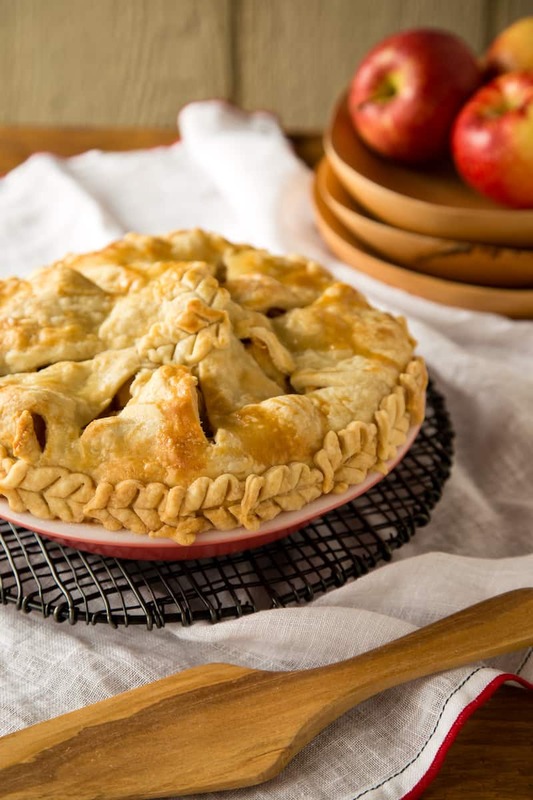 Want to know how to make pie crust without fear? 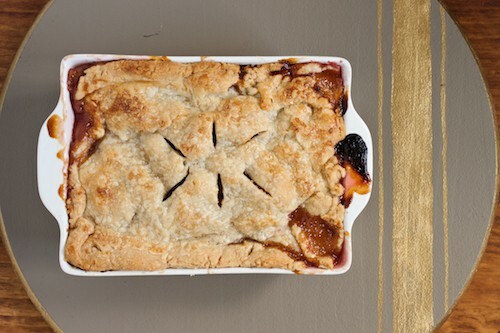 Become a pie crust professional with this easy recipe and photo tutorial. Whir the flour, salt, and sugar in the bowl of the processor a few times to sift. Adding the butter and shortening in two stages helps give you that ideal balance of tender and flaky in your finished pie dough. First, add the butter cubes and pulse 3 seconds on, 3 seconds off about 8-10 times, just enough to break down the butter into smaller bits. 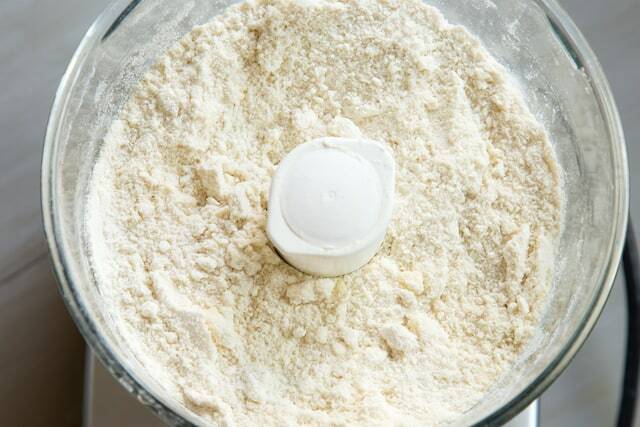 Add the shortening and pulse in using the same technique—you'll see the flour change color slightly from white to cream, and its texture will start to resemble moist cornmeal. Add 3 tablespoons ice water, along with the vinegar, through the feed tube while continuing to pulse. The mixture will begin to clump into dough. 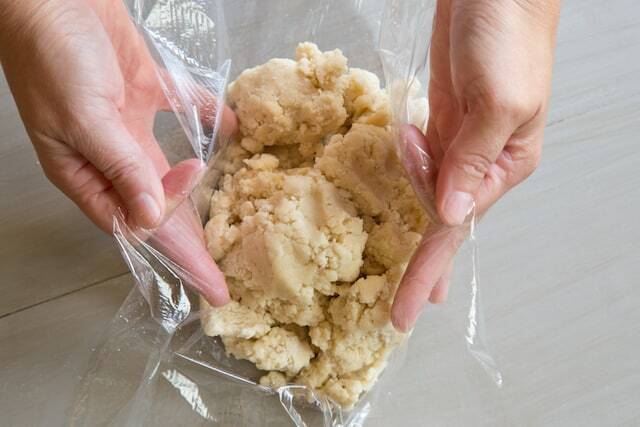 Check and see if a small bit of dough will hold its shape when you squeeze it in your hand; if it's still dry, pulse in 1 tablespoon more water. Whisk the flour, salt, and sugar in a large bowl. 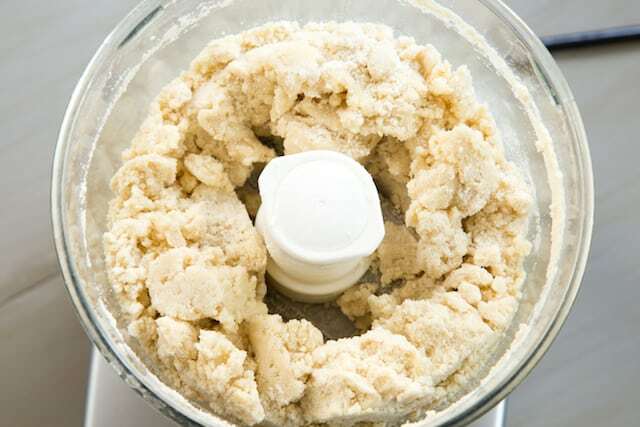 Add the butter as directed above and incorporate it into the flour with a pastry blender until it starts to break down into small bits interspersed throughout the flour. Repeat with the shortening until the flour starts to resemble moist cornmeal as noted above. Drizzle in the ice water a few tablespoons at a time, stirring gently with a plastic dough scraper or fork to combine, until the dough is shaggy but just holds its shape when squeezed in your hand. Using the bowl of a tablespoon, make four indentations in the flour and fill each of the indentations with 1 tablespoon each of ice-cold water. 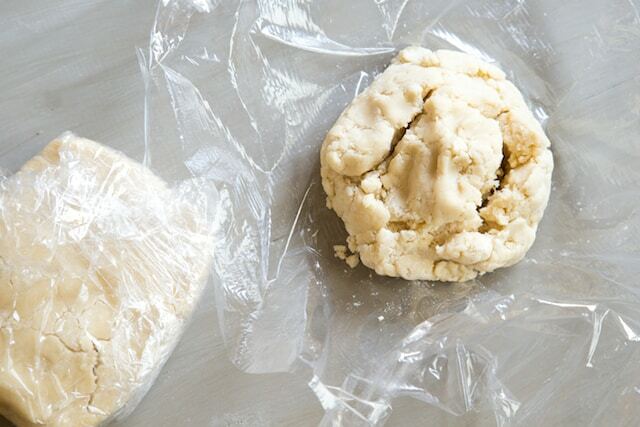 Use a fork or a plastic dough scraper to gently mix all together, drizzling the vinegar over the dough just a little bit at a time until the dough holds its shape when you squeeze it with your hand. Place 2 large pieces of plastic wrap on a clean work surface. Divide the dough into two equal portions and pat into discs. I can eyeball this division, using the palms of my hands to feel the volume of each dough portion and estimate the equivalence of the mounds but if you're just starting out, you can transfer the dough to a bowl and weigh it using your handy kitchen scale. Wrap tightly, and refrigerate for at least 1 hour before rolling out. Time to roll out the dough! Evenly sprinkle a clean work surface (like a Roul'Pat) with a light dusting of flour. Unwrap 1 dough disc and place on your work surface. If it's still rock hard and cold, and starts to crack immediately as shown above, let the dough rest for 10-15 minutes at room temperature before rolling. Start rolling the dough out in one direction, straight away from you, instead of working in a radial pattern like spokes on a wheel or rays of the sun. 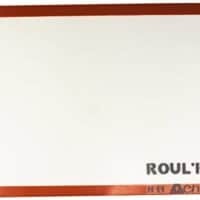 This keeps the gluten strands in the dough from working too hard and toughening up as you roll. 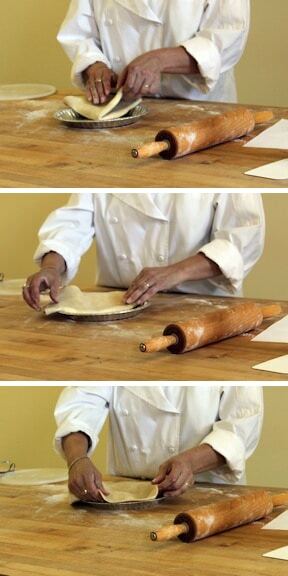 Roll about 4-5 times, then turn the dough 1/4 turn clockwise and do it again. Continue this process, turning the dough and flipping it over a few times, until you make a large round of crust. 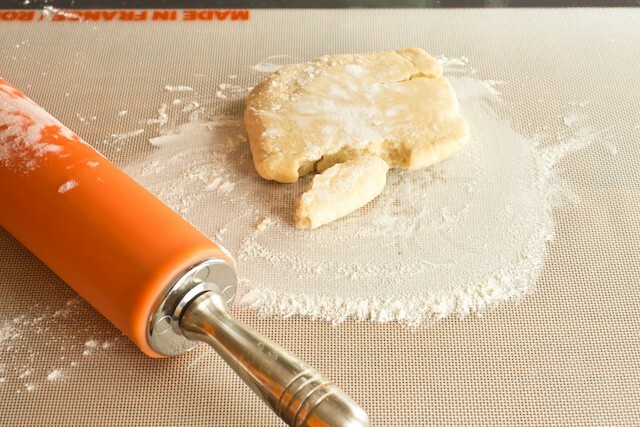 Keep your surface floured so it doesn't stick, and if the edges start to crack as you roll, fold and press them back into a circle and re-roll. Once the dough is almost 1 inch larger on all sides than your pie plate, lightly sprinkle the surface of the dough with flour and loosely fold it in half, then in half again to make a wedge of dough. Place the point of the dough wedge in the center of your pie plate, then unfold for a perfectly centered crust. Trim, fill, and bake according to specific recipe instructions. Make one batch each of a butter/shortening dough, and one batch each of a butter/lard dough. Use one disc of butter/shortening dough for the bottom crust of your pie, and the lard disc for the top crust. Stash the two leftover discs—clearly labeled, of course!—in your freezer and thaw overnight in the refrigerator the next time you want a pie.